A detailed itinerary for this ride is available below for download. Enjoy great trail riding with a self-guided ride experience. The Ride: Join us for the first Ontario By Bike Ride in 2017, as we ride along the picturesque southern shores of Georgian Bay in Grey County. 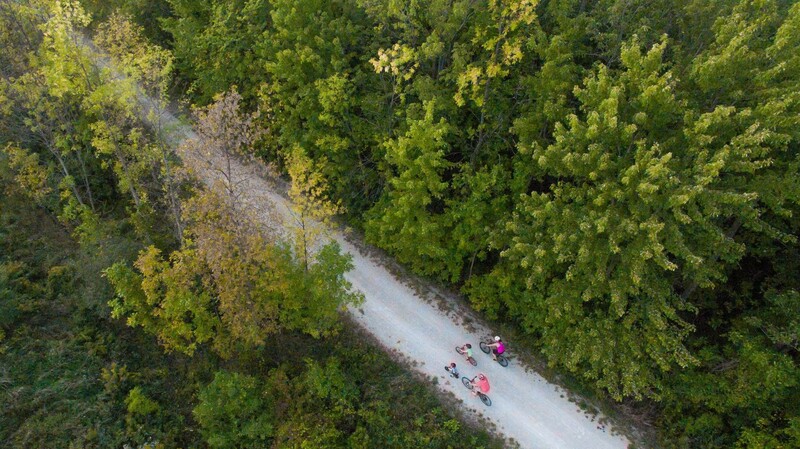 This two-day weekend tour features an even mix of riding along well-kept rail trails and quiet rural roads, both paved and unpaved. 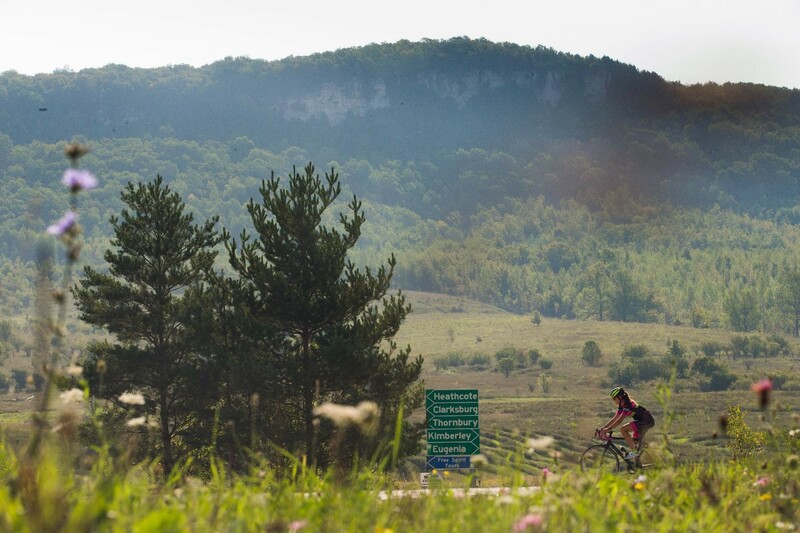 Starting from Stayner in the east and ending in Owen Sound, the route brings cyclists up and around the northern reaches of the Escarpment with frequent opportunities to cool off in Georgian Bay. Enjoy picturesque riding in southern Georgian Bay, connecting to quaint towns and villages along the way. Enjoy an evening in Meaford before continuing the ride west along country roads with vistas across the glistening waters of Georgian Bay. This small group tour includes accommodation, some meals, support van and as this ride follows a linear route, return transportation for you and your bike. We make it easy - Just bring your bike and ride. Experience Level and Ride Guide: Easy to Moderate. Riders on this tour need to have some experience riding on roads with vehicle traffic as the route is approximately half on roads and half on trails. Most of the road route is on quiet country roads, other segments are slightly busier. Off-road trails are primarily unpaved surfaces, which are hard packed so easy to ride. The majority of day 1 riding is relatively flat, with day 2 featuring more elevation changes. The terrain makes this ride suitable for hybrid bikes, mountain bikes and older road bikes with wider tires. Enjoy a group ride option or ride at your own pace using detailed maps and information provided. 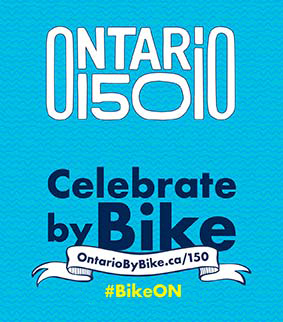 The ride starts in Stayner along the 14km Clearview Train Trail, crushed gravel, linear trail spanning from Stayner to Collingwood and the southern shores of Georgian Bay. Stop into Collingwood and visit downtown and farmer's market, before connecting to the popular Georgian Trail, west towards the Escarpment. Enjoy easy and short trips off the trail to a trailside coffee house, beaches, provincial park or communities along the way including Blue Mountain Village. 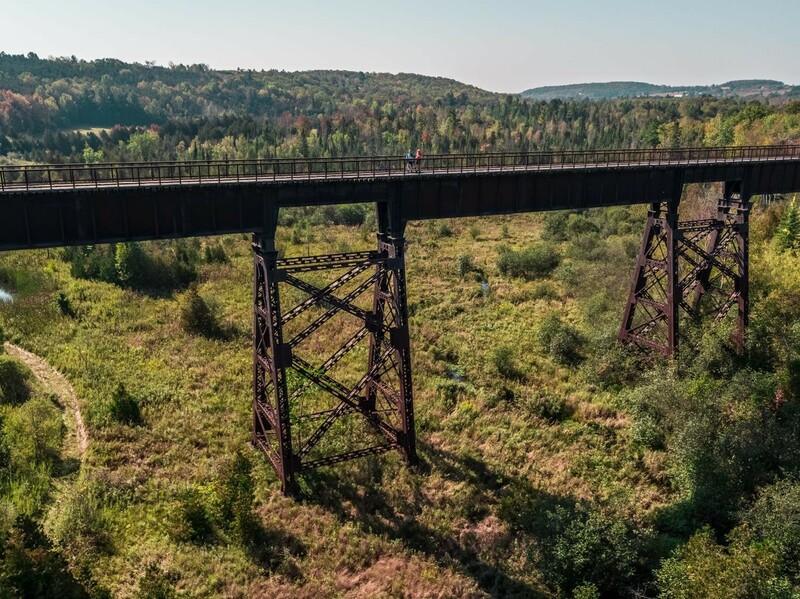 Continue riding the Georgian Trail and into the community of Thornbury, with boutique shops, local restaurants and Thornbury Cidery, as well as and the famous Fish Ladder. 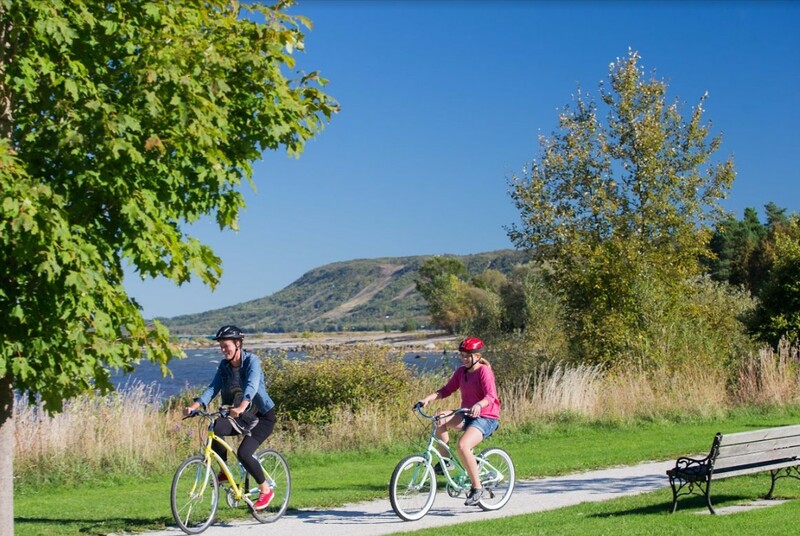 Enjoy the beautiful final 13km of rail trail with rest rooms and beach access at Christie Beach or ride into Meaford for a visit to the Meaford Hall Arts and Cultural Centre's art gallery. Enjoy shops and restaurants in town before catching up with other riders at an evening group get-together or catching a show at Meaford Hall. Overnight accommodations in Meaford. 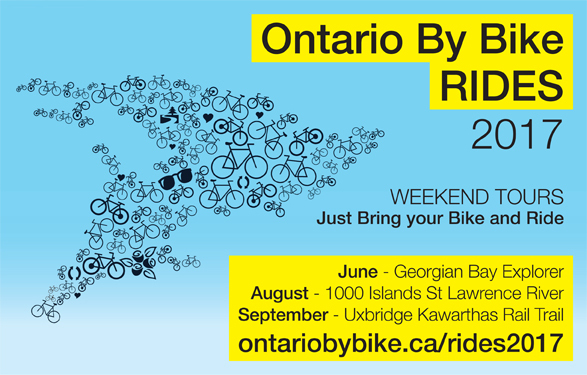 Consider overnight accommodation options in Grey County or Simcoe County for the night before ride starts. View list of certified bicycle friendly options HERE for Grey County and HERE for Simcoe County. Ride out from Meaford west towards Owen Sound following paved roads out of town. Quickly connecting to the quiet rural countryside, riders will climb up and around the Escarpment. A mix of paved and unpaved roads will bring the group past farmlands and vineyards, as this areas is this an emerging wine-growing region. With views of the bay or escarpment never far off, a lunch stop at bicycle friendly Coffin Ridge Winery will be well deserved after the morning ride. Sit and enjoy the views looking west over Owen Sound and Georgian Bay and enjoy a glass of locally grown, Frontenac Gris or Pinot Noir. 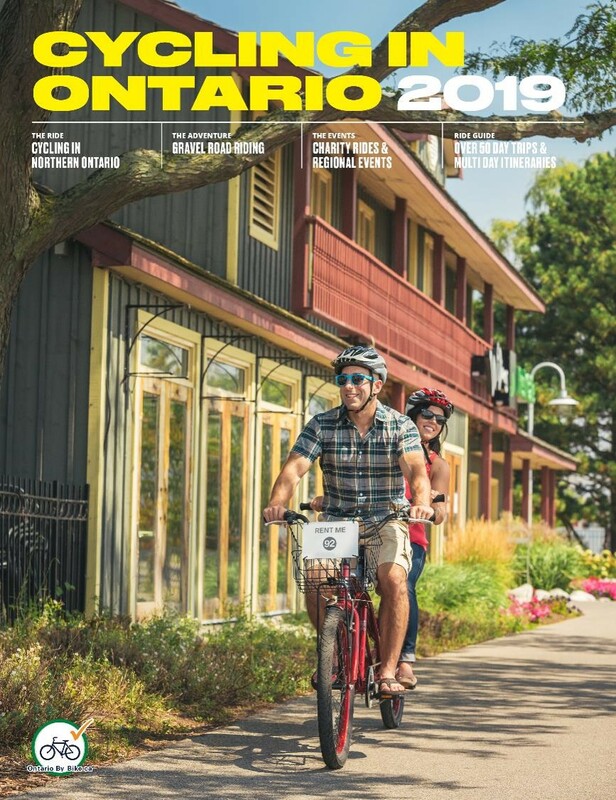 Enjoy a steady decline off the escarpment and an afternoon ride that coasts along roads with low-volumes of traffic and routing along the eastern shore of Owen Sound into town. Visit the Historic Leith Church, before arriving in Owen Sound, and what is reported to be Group of Seven artist, Tom Thomson`s final resting place and grave. Stow your bike on the truck and load onto the bus for a return ride back to Stayner and end of the weekend. End Time: 4:00pm downtown Owen Sound pick-up. 5:30pm approximate return to Stayner. Stayner is located just 15 minutes south east of Collingwood. Factor in the following approximate drive times to get to the start: Toronto 1 hour and 40 minutes; Kitchener-Waterloo 2 hours; Niagara Falls 2.5 hours; London 3 hours. 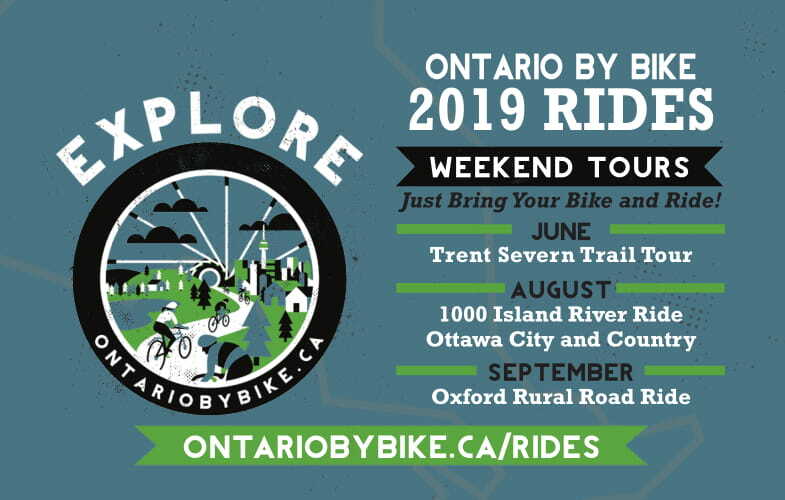 Return transportation for riders and bikes from Owen Sound at end of ride back to Stayner is included.